Summary: Following an epic scandal at their university, two master scholars search for their own meaning of love. The cold crept into Jae Shin’s bones and the sound of hail striking the roof in a steady pinging waves worried at his nerves. Turning over onto his shoulder, he shifted his legs up, curling into a ball to conserve his body heat. The sound of the storm rolled over Jae Shin and when a branch struck the side of the building, carried by the fierce wind, he sprang up to his feet, pacing to the door. The insulated paper felt cold on his hand and his fingers caught tightly on the panel separators, his nails cutting grooves into the hard wood. His mind echoed with the memories he had of Yeorim. If there was one thing the scholar hated more than being disheveled, it was being cold. He complained endlessly about the ache in his fingers and the bite of wind on his cheeks when they’d been out walking in a light snow. Jae Shin shuddered to think of the man’s discomfort if actually caught in a winter storm. He was out the door and across the walkway before the memory of Yong Ha’s shivering faded. His heavy footsteps shook the wooden planks, the trembling echoing onto the frost gathering along the walkway’s overhead beams. His breath misted the air on his face and after a few short strikes, Jae Shin realized he’d left his room without shoes. Looking around, he grabbed at the nearest pair of boots that looked to fit him, shoving them onto his feet. A quick stepping run took him across the pavement and in front of Yong Ha’s door. A soft glow lit up the panels of his room, turning the antique white panels to gold. Slightly relieved, Jae Shin almost turned back to his dormitory when he heard laughter come from inside Yong Ha’s room. Another guffaw, this one more muffled than the last, warmed the air and Jae Shin straightened, his spine stiff with outrage. Stomping up the short steps, unmindful of the muddy sleet he tracked over the upper walk, the young man grabbed Yong Ha’s door panel and wrenched it aside, nearly tearing the slider off its rails. “Some people?” Yong Ha slid free of his covers, standing artlessly before the other man. And Jae Shin lost not only his breath but his mind. Always of a more slender build than Jae Shin, the man’s pale ivory underclothes accentuated his long, lean body. Raised mainly by his former gisaeng grandmother, Yong Ha moved gracefully, as if a dancer whose entire stage was the world and the disparities of their natures was never more evident than when Jae Shin was confronted by the young man in dishabille. Normally fastidious to a fault, he often chose to be more relaxed in his own private space, undoing the knot of his hair and loosening the bindings of his underclothes before sleeping. With his shoulder-length hair down around his pretty face, Yong Ha’s masculinity shone through with the strength of his features and the glimpses of his pale, sculpted form visible through his gaping robes. The shadows on his abdomen were firm, scalloped lines of muscle Jae Shin itched to explore… to lick or … in the faintest recesses of his mind, to stroke with fingers intent on doing other wicked things as well. “Don’t.” Jae Shin took a step forward, his hand trembling uncontrollably as he reached for Yong Ha’s hand. He wanted to tell Yong Ha not to draw his hair up or tighten the upper robes of his clothing. The words stuck as he tried to talk, dusty pale barbs digging into his chest and neck and Jae Shin wondered if he would die from choking on them, or worse, speak them out loud and condemn himself to Yong Ha’s ridicule. Yong Ha let his hair drop back to his shoulders, crossing over to where Jae Shin stood. His hand was warm, nearly touching Jae Shin’s chilled face when the rebel jerked his head back slightly. Their eyes met, each man warring with the need to maintain control over the desires raging through them. And each hoping they would lose. “Did you worry about me, my Geol Oh?” Yong Ha’s fingers hovered, nearly skating over the other man’s cheek. The wafting chill from Jae Shin’s face bothered him as did the puffs of mist from the man’s parted lips. Yong Ha longed to feel the scruff of Jae Shin’s chin in his palms and taste the bitter-hard undertone of soju he knew lay on the man’s tongue. His mind struggled with the realization of his longing — especially at the fearful, sour look Jae Shin gave him before he moved his face away from Yong Ha’s touch. Turning, he stomped out of the room before Yong Ha could respond, leaving the man standing open-mouthed and confused. Jae Shin was halfway to his dormitory when Yong Ha huffed, disgusted by the other’s rejection. Jae Shin’s retreating back stung Yong Ha more than his cutting words and a simmering anger rose in the scholar’s belly. He’d spent the evening waxing on to Mae-chung on Jae Shin’s virtues while the bestial wretch wished him dead of cold. Gritting his teeth in frustration, Yong Ha crossed over to the edge of the walkway and sat down, wincing at the feel of the icy stone through his clothes. Reaching under the platform for his heavier boots, he pulled one on then the other as he recanted all of the nice things he might have said earlier that evening. Fully armed with a high temper, Yong Ha strode across the lawn, the soft linens of his white garments dusted with a fall of light snow. His long legs carried him quickly and with none of the strolling elegance he was known for. Each purposeful step on the cold hard ground brought him closer to Jae Shin as he walked, he thought of what to say to the quick-witted young man. “I could say; if I had half a mind, I’d gut him but then he’d respond with something snippy like Oh, Yeorim — no, he’d call me Goo Yong Ha to annoy me. Aish, Yong Ha, you don’t have much mind to begin with, are you sure you can spare half of it?" He nearly slipped stepping on the platform stone, an ice forming in the rough cracks and Yong Ha caught himself quickly with a grab at a porch post. Shaking some feeling into his legs, he mounted the walkway, and stopped short, finding himself nearly face to face with another of Sungkyunkwan’s seniors. They’d passed one another for more than a year, two mongoose scraping out their territories. Coming in from a prestigious Suwon university, Kim Dae Min quickly proved to be a formidable student, climbing through Sungkyunkwan’s ranks. While not as vividly attired as Yong Ha, Dae Min cut a stylist figure wearing a jungchimak made of a silk Yong Ha recognized as one he’d dismissed as being too muddy for his colouring. The stark burnt cherry dye against Dae Min’s light gold skin complimented his striking features and brought out the deep brown of his eyes. Nearly Yong Ha’s height, his thicker shoulders filled the garment out more than Yong Ha would have although its hem was soaked through from the icy slurry on the ground. Yoon Hee openly debated — mostly with herself — on which of the two senior scholars were more of a peacock, eventually always deciding on Goo Yong Ha because it thrilled him but Yeorim secretly guessed it was closer than he’d like. “Sunbae.” Dae Min inclining his head in greeting. He glanced down at Yong Ha’s apparel, his sloe eyes taking note of the man’s tousled hair. “Hardly sunbae,” Yong Ha laughed off, keeping his smile tight so the other man couldn’t hear his teeth chattering. “I take it you are heading to see Moon Jae Shin,” Dae Min said as Yong Ha’s shoulder passed his. “I wondered… being relatively new to the school… if such behaviour was normal. That perhaps men of the city often chased one another across the school’s inner courtyards; one half-dressed and the other in high temper?” Dae Min’s smile was faint and Yong Ha tightened his fist, wanting to punch the smugness from the other man’s face. “Say what it is you want to say,” Yong Ha spat, too used to the machinations of the merchant class to have much desire to debate another scholar in the brittle cold. “Good,” Yong Ha sniffed, his dignified response ruined by the burning red of his nose. He took two steps down the walkway when Dae Min’s voice cut through his resolve as easily as a sharp knife through a pear. 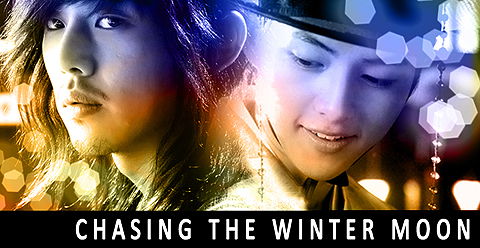 Yong Ha recoiled, releasing Dae Min as quickly as if the man’s coat burned him. His Geol Oh’s treatment of him derailed him, Yong Ha thought, it was the only reason he’d failed so quickly at the game Dae Min played. The skillful cunning of word play edged with a sharp threat wasn’t unknown to Yong Ha but coming from Dae Min, unexpected. The young scholar in the past preferred to keep to simpler, safer games; excelling at lessons or winning at the city’s gambling houses. It appeared to Yong Ha, Dae Min was dangerously treading the line of becoming a political rival — and using his friendship with Jae Shin to force Yong Ha to give up ground. “He what?” Yong Ha’s stomach left him, crawling away alongside his courage and temper. “You dare?” Yong Ha drew himself up, casting a disparaging glance. “You dare?” Yong Ha snarled, taking a menacing step towards the other scholar and stopped as a door panel slid open behind Kim Dae Min. Kim Dae Min left the panel open barely wide enough to give him a view of the courtyard… and Goo Yong Ha. The senior scholar appeared to be flustered, tugging on his lower lip as he paced the walkway, stopping momentarily at Jae Shin’s door before stalking off again. The first-year student often served as his servant, a poor second cousin now poised to become a government official through his relative’s more powerful connections. Dae Min was fond of the younger man, although often frustrated at his lower intelligence but certain things could not be helped, especially considering Bon Hwa’s common-born mother brought nothing to the family line but a field of cabbage and a few goats. Still, Dae Min was grateful for the younger man’s companionship, especially when he needed something done and he couldn’t be seen doing it. Born in Hanseong’s lower districts, he’d grown up in the gaming halls and black markets, well versed at lightening a pocket or snipping a hair pin if desired. Discovering his cousin was more worldly than he imagined was a benefit to Dae Min. Discovering his cousin had little to no morals had been a delight. ♥♥♥♥ smooches ♥♥♥♥ [_]) cocoa? ♥♥♥♥♥♥ go to bed baby! :::tucks you in::: smoooooches :D ♥ hugs. Oh Dae Min try all you want, we'll sit back and watch you get kicked by the wild horse and pecked to death by our flambouyant peacock. On a side note, how fricken cute is Goel Oh? Nawwwwh I wish him and Yeorim would just stop dancing around each other already! ♥♥♥♥♥ smooches and yes, dae min does. our yeorim will have to be on his toes. :D thank you for reading!